The Irish flag is probably the most internationally recognized emblem of Ireland, the harp being the official emblem. 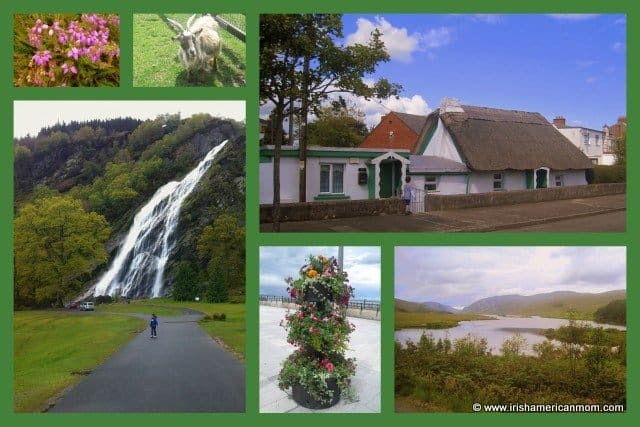 Today I thought I might continue my series of posts on the symbols of Ireland with a brief exploration of the history and symbolism of our flag. The Irish Flag is a tricolor boasting vertical stripes of green and orange, separated by white that symbolizes the hope for lasting peace on the island of Ireland. But how many of us know how Ireland’s flag was chosen, where it was designed, why the colors were chosen and the history of when it was first flown? Well, don’t worry. Today we are going to delve into a little bit of Irish flag history, and try to answer these flag inspired questions. 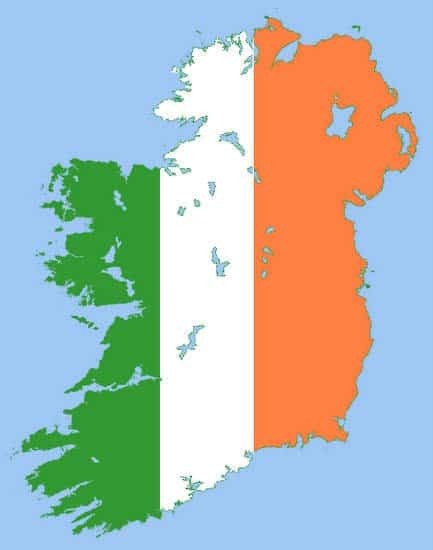 Believe it or not the Irish flag wasn’t designed by any Irish man, woman nor child. No! It was a group of French ladies who first came up with the idea. And of course, their own tricolor of red, white, and blue provided inspiration. And how did all of this come about? Well, in 1848 Thomas Francis Meagher and William Smith O’Brien of the Young Ireland movement headed off to France at a time when Paris was in the throes of a mini revolution. While there, a group of French women presented them with a newly designed Irish flag, inspired by the revolutionary flag of France. The tricolor of France was designed to represent the people of France . White is the traditional color of the House of Bourbon, the rulers of France before the French Revolution. The color white on the flag represents the King. The red and blue represents the city of Paris and the revolutionaries who wore blue and red ribbons on their hats. The Irish tricolor presented to Smith O’Brien and friends was designed to represent Ireland’s green nationalist and orange unionist traditions, separated, yet joined by a white zone of peace. I just think this symbolism is beautiful. Here’s hoping, that for centuries to come, the central white stripe will signify a lasting truce between the ‘orange’ and the ‘green’. When I was a little girl in school in Dublin in the 1970’s we learned that our flag was “green, white, and gold.” I never learned about the true meaning of our flag, like children learn about the stars and stripes in America. As a child of about 8, I remember thinking to myself, “it’s orange, not gold.” I asked one teacher why we said ‘gold’ not ‘orange’, to which she replied, “it’s a golden shade of orange.” So much for enlightenment. And talk about undermining the beautiful egalitarian purpose of the flag with our ‘golden’ stripes. Back in those days Ireland was only a free nation for about 50 years, but now that 100 years have past since 1916 I’m so happy we are embracing the true symbolism of our flag. The Irish Government now actively discourages the flying of flags with a lighter “golden shade of orange” as my teacher called it. The Irish flag is an emblem of inclusion and reconciliation and represents the entitlement of every Irish person to be part of the Irish nation, regardless of ethnic origin, religion, or political conviction. Thomas Francis Meagher returned to Ireland from France with a beautiful, silk, Irish tricolor, which he raised publicly for the first time in his native city of Waterford on March 7th 1848. Meagher’s flag was carefully folded and put away, and stored with mothballs I presume, because it didn’t see the light of day for 68 years, until it was raised again over the GPO during the Easter Rising of 1916. In 1922 it was adopted as the flag of the Irish Free State, and in 1937 it was ratified as our National flag in the Constitution of Ireland. 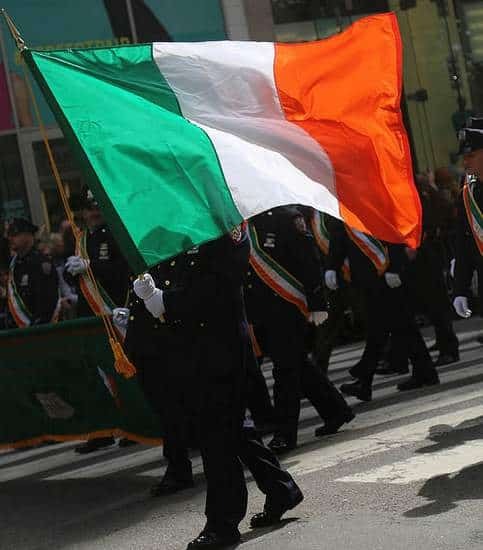 There are some special rules associated with the use of the Irish national flag, just like there are rules for how the American flag should be handled. The main rule is that no other flag should be flown above the Irish flag. It’s also important that it does not touch the ground or become entangled with trees. Slogans and logos should not be placed on the flag. Don’t tell our soccer supporters, they’re breaking all the flag rules with their funny slogans on our flag. I don’t know if this rule about slogans applies to the American flag, especially because it is used so widely for clothing and other patriotic items. 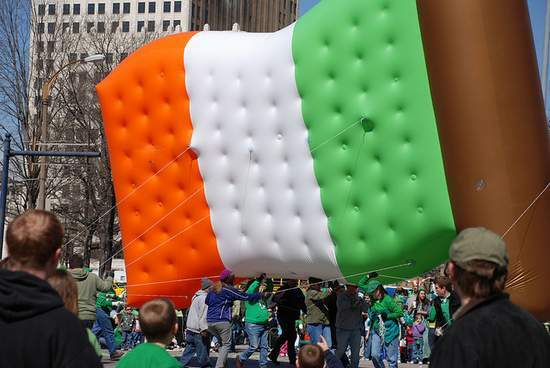 I suppose the big Irish flag balloon in the picture above may not adhere exactly to the rules. As part of the 1916 commemorations, a program has been established to present a national flag to every school in Ireland together with a copy of the 1916 Proclamation, and a booklet detailing the protocols for respecting the flag. On Proclamation Day, March 15th, 2016 schools all around Ireland will display their Irish flags. If you’re interested in learning more about the Irish Flag check out the Irish government’s paper about the National Flag of Ireland. And so, when you see an Irish flag billowing in the wind wherever it may be raised across the globe, I hope your heart stirs with a little bit of Irish pride, knowing that it is a beautiful and inclusive symbol, designed to represent all the people of Ireland. As always your posts are so interesting and informative , thanks Mairead……..
Hi Pat – I’m so glad you found this post to be helpful. Thanks so much for stopping by, to check out my latest Irish history installment. Thank you, Mairead, for the background of the Irish flag. I also appreciate the inclusive tone of the piece. I grew up in an isolated Irish town in Northeastern New York where the lines were strongly drawn between the Protestant and the Catholic. I hope that in 2016, now 50 years after the great Uprising, we can all grow toward being Irish rather than divided Irish. I hope to celebrate my green and orange and white exterior Irishness regardless of religious interior. Hi Annie – I’m so glad you appreciate the inclusive symbolism of our flag, and like you I take pride in it’s egalitarian meaning. I love your suggestion for writing a blog post on hurling. I must add that topic to my ‘to write’ list. Best wishes, and thanks so much for checking out my ramblings. 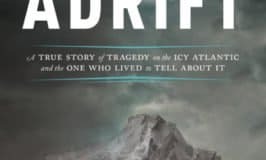 Thank you Mairead, so interesting, im glad you shared the blog. amazing stuff. Hi Maureen – I found the history of our flag to be really facinating too. I never knew it was designed in France until I started reading about it’s history for this blog post. Thanks, as always, for checking out my ramblings. I did not know the Irish flag was “French!” Very interesting fact! My friend visited me here in the U.S. And said she was amazed at all the American flags flying all over the place just on a normal day, not a holiday. She said that in Ireland you would not see the Irish flag nearly as much. Is that true Mairead, or just her opinion? FYI, people are not supposed to write on the American flag either or make it into clothing or drape it around yourself. You can wear an image of it on your clothing though. Hi Patricia – Your Irish friend’s observation about flag flying in Ireland and America was very true. The Irish flag is not displayed around Ireland as much as the American flag is flown in the US. Perhaps that may change this year as 1916 is commemorated. I celebrate the anniversary with you. It is a time to get your flags out and fly them. I hope it continues. 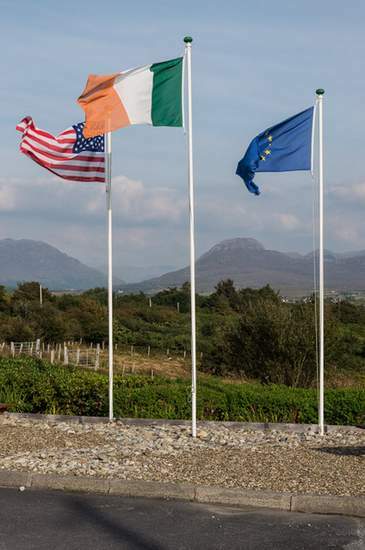 As shown in your top photo, the flags I saw in Ireland were always flown with the EU and the US flags. Typically at some official location; but is it part of the protocol or is it an unwritten sentiment? Hi Gene – I believe that most Irish people leave the flying of our flag to those in charge of official locations due to unwritten sentiment. In parts of Northern Ireland flying of the Irish flag may be perceived as provocative despite it’s egalitarian symbolism. There, different flags are seen as highly emotive emblems of national identity. 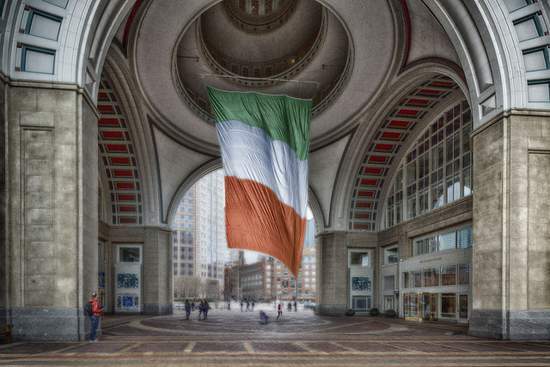 To avoid stirring the proverbial political pot, many Irish people choose not to fly national flags, unlike many Irish Americans who proudly display their American and Irish flags. In Ireland, county flags are more widely flown beside people’s homes in support of their GAA teams. Thanks Mairead for this article. I was recently asked about the tricolour by an American acquaintance here in California and while I knew that it was based on the French flag, I was very short on the details. So I appreciate you presenting the history for us all to be more educated, in this historic year! 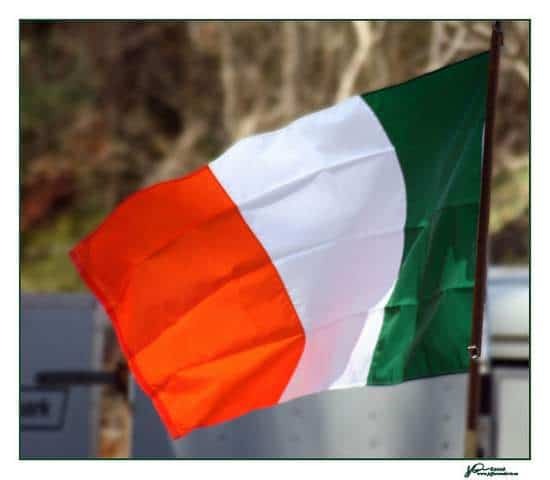 Hi Mairead – Like you, I have often been asked about the meaning of the Irish flag, and I knew little about it until I investigated further for this blog post. I found my children learned quite a bit about the American flag in their school in Kentucky, but I never remembered learning much about our Irish flag. I was glad to hear that Irish school children are learning about it to mark this centenary year. Thank you for this fun info, Mairead*! I am grateful to have a flag of my Dad’s of the lady & the harp on the green. It’s an interesting story of how the present day tri- color flag came to be. We honor both the American flag & the Irish flag on my home. & and am so proud to do so!!! How wonderful to have a beautiful Irish flag that belonged to your father. It’s lovely to hear you fly the Irish and American flags with pride on your home. Since Valentine’s Day is over, next up is St. Patrick’s day. (My favorite holiday! :)) since we are all talking about flags, this might be a good day to hang my tri-color Irish banner on my front door! Forgot all about this being the anniversary, thanks for the reminder! Roll on St. Patrick’s Day – I love our holiday too. And this is the perfect year to hang out our Irish flags to share our national pride. Hi Jackie – I’m so glad you enjoyed this post about our flag. I just found your blog a couple of weeks ago. 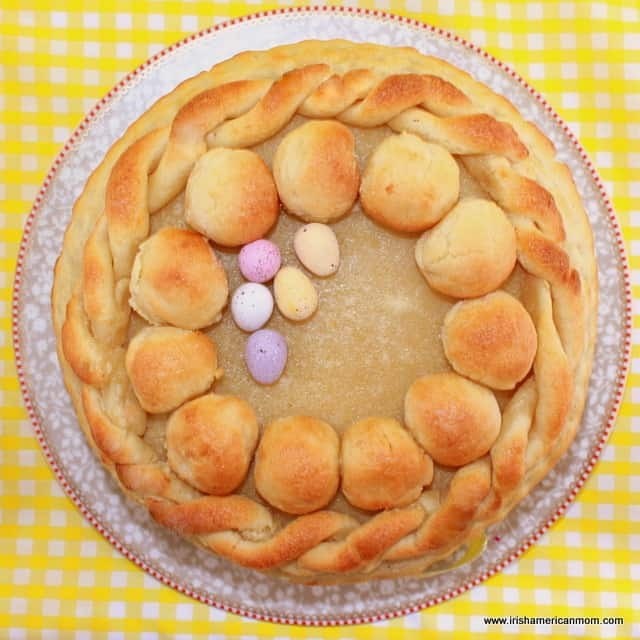 Loved this post AND your blog! Thanks so much! 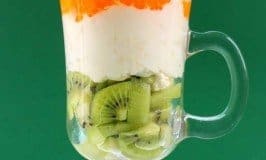 Hi Becky – It’s just lovely to hear from readers who enjoy my recipes and ramblings. 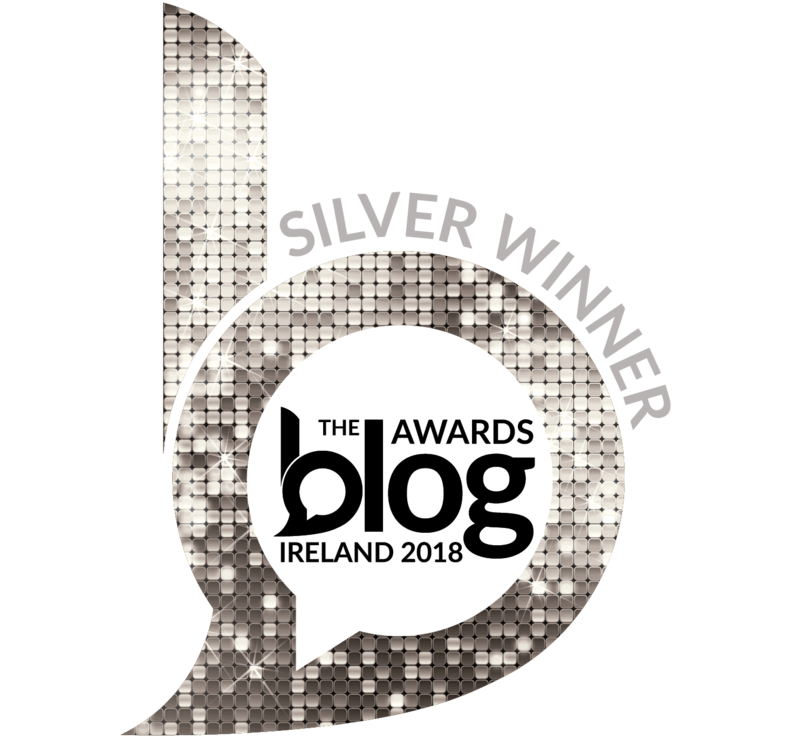 Thanks so much for taking the time to check out my blog, and do stop by whenever you get a moment for a few stories about Ireland and Irish America. 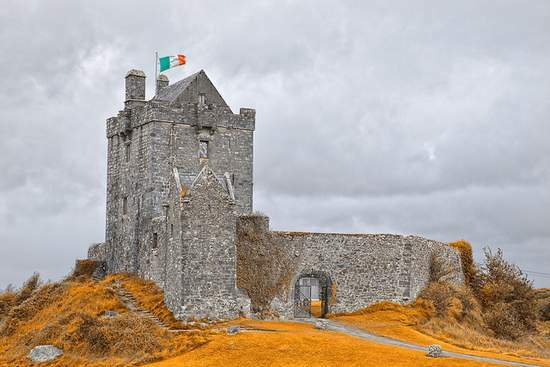 Hi Rahul – I find it very interesting that Ireland and India, two countries that were part of the British Empire, both chose green, white and orange as the colors for their flags. Thanks so much for this observation. Love how the white in the middle stands for peace. Perfect! Hi Cheryl – I’m ashamed to say I didn’t understand the symbolism of the Irish flag until recently, but the white stripe of peace is perfect for joining the people of Ireland.